ATLANTA (AP) The Atlanta Falcons can breathe a bit easier. Still to be resolved: Can this team recapture the form that carried it all the way to the Super Bowl last season? After surviving a miserable day at the Meadowlands for a 25-20 victory over the New York Jets , the Falcons (4-3) were finally able to turn their focus to the NFC South race. They’ll face a divisional opponent for the first time on Sunday when they hit the road for the third week in a row to take on the Carolina Panthers (5-3). Due to a quirk in the schedule, Atlanta is the only team in the league that hasn’t played a division foe. The NFC South field is tightly bunched, with New Orleans (5-2) on top of the standings and riding a five-game winning streak. Only Tampa Bay (2-5) has fallen off the pace. The Falcons snapped a three-game skid with their victory over the Jets, which came on the heels of an ugly 23-7 loss at New England in a nationally televised rematch of the Super Bowl. But, other than an impressive win over the Green Bay Packers in Week 2 , the Falcons have yet to reach the form they showed last season, especially on the offensive side. ”I’ve played in situations where we’ve had some heavy rain or tough wind for a little bit, but really from kickoff until the end of the game, it was coming down pretty hard,” he said. The Falcons are still scuffling in the middle of the NFL pack, averaging 21.9 points per game, after leading the league in scoring in 2016. The lack of a strong running game remains one of Quinn’s top concerns. The numbers against the Jets looked pretty good – 140 yards on 32 carries – but a big chunk of that came on Tevin Coleman’s 52-yard run. Otherwise, the Falcons were held to 88 yards on 31 carries – an average of just 2.8 yards. ”I thought we had opportunities to create a few more,” Quinn said. ”It was good to see Tevin break a long one at the end. But we can take our run game better than we did (Sunday). I think we have at times this year. We’re still committed to it. Coleman was in the game for the closing minutes after Devonta Freeman went out with a shoulder injury. The Pro Bowl back will probably be limited when the Falcons return to the practice field on Wednesday, according to Quinn. Otherwise, Atlanta came through the game with no major health issues. 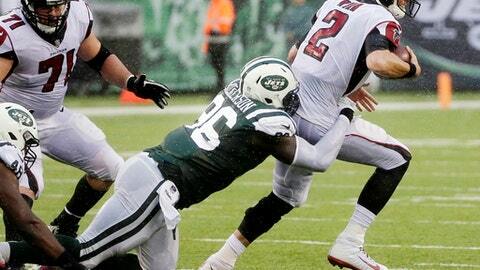 Quinn had nothing but praise for the run defense, which held the Jets to a season-low 43 yards on 22 carries. The Falcons had given up more than 100 yards in three straight games, including 162 yards the previous week against the Patriots. ”We were really committed to doing it right,” Quinn said. ”That part of the game felt real familiar in terms of everybody just being assignment-sound, doing their jobs, not stepping out of the gaps to go make a play. ”The consistency of the run defense is what really jumped out. We took a big step toward becoming the unit – especially in the run game – that we can be.